The permanent protection of the land now named “The Woodlot Sanctuary” was made possible by the generous donations of two local families: The Bates and Frohn families. Three lots totaling approximately 29 acres include a variety of habitats. Much of the central portion is upland forest featuring rocky outcrops and glacial erratics. The landscape shows a history of varied forestry practices over decades. It is now dominated by oak and beech with hickory, sassafras, and scattered evergreens as well, and offers an excellent understory of huckleberry and lowbush blueberry. 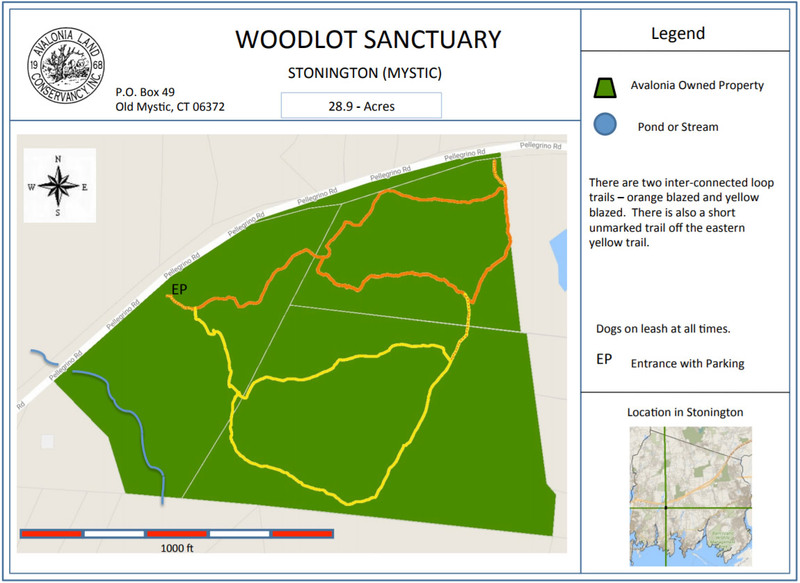 The eastern border is comprised of wetlands that emerge into a brook that flows ultimately into Stonington Harbor; wetlands in the western portion drain directly into the Deans Mill Reservoir. The preserve is home to a variety of wildlife including several species which have special status in CT. Box turtles and spotted turtles have been found on the property. Red-shouldered hawks and broad-winged hawks are regular nesters as well. There is an established trail system with two loops and connectors to a small off-street parking lot.